Appealing and unpredictable, the high-energy rock n’ roll of Madison’s Awesome Car Funmaker is just plain infections. They recently celebrated their two-year anniversary, a feat in this modern age of bands. ACF recently finished their next record, the follow-up to 2004’s Green Means Go, but are waiting to let the freshman disc sink in before unleashing the new stuff. Up next for them is taking the show on the road, exploring outside of the Madison venues where they’ve cut their teeth over the past two years and plan to take off on a 10-city tour before the end of the summer. Hooky, hip, and hilariously self-reflexive, Awesome Car Funmaker will make excellent ambassadors to the rest of the country. 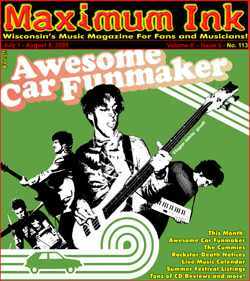 Catch Awesome Car Funmaker at the Maximum Ink/Berghoff Rockstage at the Atwood Summerfest in Madison, Wisconsin on August 6th with the Gomers, Y-Slim, the Bar Tabbies, the Motorprimitives and Magic 7. The 23rd Atwood Summerfest takes place on the same block of Atwood as the Barrymore Theatre. Magic 7, featuring Buddo and Paul Schluter of Last Crack will be making a rare appearance at this year’s event since breaking up in 1998. Madison’s legendary Tar Babies live on through Bucky Pope and his band the Bar Tabbies, which feature two thirds of the Tar Babies. Y-Slim, an electric, groove oriented jam band that features Magic 7 drummer Jeff Grieshammer have planned a hypnotizing set. The legendary lounge-lizards The Repile Palace Orchestra will provide the cultural side of things with their version of Balkan Lounge Music.